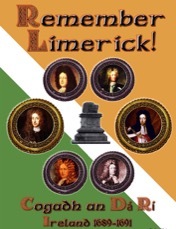 Remember Limerick! (RL!) 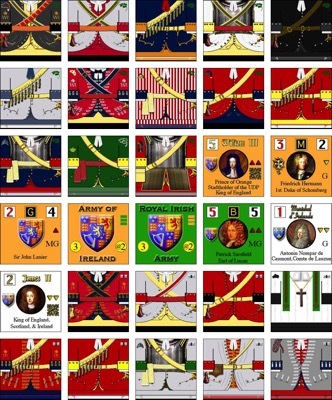 is the seventh volume of Red Sash Games' Lace Wars series, and opens a new subject, the Nine Years War, sometimes called the War of the League of Augsburg, It is a two-player simulation of the Cogadh An Dá Rí, The War of the Two Kings, otherwise the Williamite War in Ireland. The conflict lasted from 1689 to 1691, and saw two pitched battles - one the largest ever fought on Irish soil - many skirmishes, and several desperate sieges. King James - Dismal Jamie - abandoned the struggle early on, but by that point the Irish were fighting for themselves. But the English throne brings with it the governance of Scotland and of Ireland. While some in these countries welcome the Glorious Revolution, many do not. Especially is this so in Ireland, where a small Protestant minority lords it over a helot population of Irish and Anglo-Irish Catholics - an Ascendancy secured only a generation before by the swords of Oliver Cromwell's men and still maintained by force of arms and by force of English Law. In the last years of King James' rule, his Deputy, Richard Talbot, Earl of Tyrconnel, has worked hard to overturn this Cromwellian Settlement, stuffing the Administration and the Army with Catholics. The Protestants are afraid. 1) One map representing Ireland, derived from a mix of modern cartography and period maps. Scale is 4 leagues (16 Km) per hex. 2) 480 die cut counters representing the forces of the Williamites and the Jacobites: Irish, English, Scottish, Dutch, French, Danish, and Huguenot. Scale is Battalion - that is, the playing pieces represent battalions and regiments. IMPORTANT. Ownership of is required to use this module. A set of alternate maps are available for RL! These depict Ireland at a scale of one league (4 Km) per hex. These are available upon request - see The Depot section.